It's no big secret that I loved the Adidas adiZero PR. The PR was an early attempt at an ultralight flat, taking the sacrifice of cushion and structure in order to save weight to the extreme. At only 3.9oz, the PR was little more than a spike without a spike plate. Coming off of several years of high school and college running, I yearned for the familiar feeling I got from spikes, and the PR was pretty much a spike for the road. I wore that shoe for everything from the 5K to the half-marathon, and if the praise that shoe gets on LetsRun is any indication, I wasn't the only person who loved it. Then, sadly, Adidas discontinued it. Desperate for a replacement, I first tried the ASICS Piranha. The Piranha wasn't bad, I guess...I mean it was still super light and felt ridiculously fast, but for some inexplicable reason, I found myself overpronating noticeably in them, something that never happened in the PR. I eventually gave them away to a friend. Then Mizuno began offering the Mizuno Wave Universe 4 in small sizes (earlier models were only available in men's 8 and larger, I believe). I gave them a try next, and I believe that fans of the adiZero PR may finally have a replacement. The Wave Universe 4 is a minimum feature, minimum neutral shoe designed for racing. It is built with a curved shape. AP is a full length copolymer midsole that provides lightweight, responsive, and durable cushioning. Printed Overlays are located at both the medial and lateral sides and help hold the foot in place. Standard Sockliner provides underfoot comfort. G3 Sole is a lightweight rubber dot pattern in the forefoot for increased grip and flexibility. The first thing that I noticed is that the Universe does not have the traditional thermoplastic Mizuno Wave plate that the other shoes have. Yeah, the Running Warehouse description says it does, but I'm pretty sure they just pulled that off some other shoe's description, because the Universe's Wave is definitely not thermoplastic...it's the same soft blown foam that makes up the midsole. You can see the design of the "wave" on the side and sole of the shoe, but you can also twist it around and leave an indention in it with your fingernail because it is made of foam. This probably doesn't come as a surprise to anyone who has worn the PR or the Piranha...when the sole is that thin and minimal, there's no room for any extra technology. The Universe is about as stripped down and low to the ground as you can get. That middle grey thing (not the wave) in the sole is a really thin plastic, but it doesn't seem to impact the ride of the shoe in any way. Oh, and no Wave with no real cutout means there's no danger of getting rocks stuck in the sole! It probably also comes as no surprise that the Universe is extremely flexible, both in forefoot flexibility and torsional flexibility (I can actually roll up the heel too, but that's a nonfunctional party trick since your calcaneus doesn't flex like that). It's roll-into-a-ball flexible the way the Nike Free is, meaning it is far more flexible than most other racing flats I've worn, and is certainly flexible enough to flex any way my feet want. This flexibility, combined with a non-existent heel counter and an extremely unstructured upper, makes for a shoe with the least inherent stability of any shoe I've worn. The PR, Piranha, Minimus, etc all had overlays on the upper that did a little bit to support your foot. Not so with the Universe. This is as close as you get to huaraches without looking like a caveman. Look ma, no heel counter! As I stated in the above paragraph, the upper of the Universe is almost completely unstructured. It is devoid of any overlays, and is made of a very thin, light, wispy material that lets your foot do as it pleases. It is a very comfortable upper, and I could probably wear them as bedroom slippers, though part of me does wonder if it will prove to be a durable material (don't have enough mileage on them yet to say). The seamless upper and soft insole make for a very comfortable shoe sans socks, and the light and airy upper promises to keep your feet as cool as possible. The Universe sacrifices cushion for weight, so you can expect to feel the ground when you land. Lots of groundfeel, little cushion. Lots of response, little cushion. Any cushioning in the Universe will be done by your feet and other joints, because you won't get much from the shoes themselves. They will be nearly as responsive as spikes though (perhaps a little less, due to them having flexible forefoot and lacking the stiffness of a spike), since there is next to no cushion to compress. You can also expect to feel every rock beneath your feet, and they're likely to have too little protection for anything besides the road. As for ride, expect your feet to do all of the work themselves. There really isn't much stiffness to the shoe to pop yourself into the transition, the way there is with a spike or with the Wave Ronin. Of course, there's no cushion to get bogged down in either. The ride really is as close to running barefoot as you can get while still wearing shoes (obviously there is a huge difference in groundfeel with thin sole vs barefoot, but transition and ride are remarkably similar, all things considered). Sole of the Mizuno Wave Universe. You can see how wide the toebox is from this angle. Unfortunately, there is one area where the Universe falls short of the PR, and that's in fit. The PR had a very spike-like performance-oriented fit. On the other hand, the Universe has a roomy toebox, like you'd expect to find in a minimalist shoe that encourages toe splay. I couldn't tell you whether this is because it's a unisex shoe and all my other Mizuno shoes are women's and that's the way all of their men's shoes are cut, or if the wide toebox was a deliberate design choice, but I don't like it. Most of my flats are unisex and the Universe is the only one that's wide like that, so I can tell you it has a wider toebox than most other unisex flats. However, I don't have a men's Ronin or Musha to compare, so I don't know if it's men's Mizuno flats or just the Universe or what. It's not annoying enough to prevent me from making the Universe my short distance racer, especially since it's awesome in every other way, but it's definitely something that holds it back from making my personal "favorite shoes" list. Of course, the roomy toebox, low heel-toe drop, lack of structure, and non-existent cushioning make the Universe an excellent choice for the minimalist who wants an extremely minimal shoe. It may not have the "minimalist" label, but make no mistake, the Universe is much less shoe than most shoes that are marketed as minimal, and is about as minimal as you can get and still look like you're wearing regular shoes. Mizuno Wave Universe. You can see the seamless upper which only has printed overlays (save a stitched-on Runbird) here. In short, I'll recommend the Universe to two different groups: biomechanically efficient runners who are looking for a super low-slung ultralight flat for short distance races, as well as minimalists looking for as little shoe as possible. It's a very cool shoe that is as close to the adiZero PR as you'll find today, and it's also an easy transition for runners who are used to racing in spikes. It won't be enough shoe for longer distances for most runners, and it doesn't provide any real support or cushioning for those who need it, but if you made it this far into the review, you aren't looking for that anyway. The only catch to be aware of is the roomy forefoot, particularly if you like the foot-hugging feel of a narrower last. Also, if anyone can speak to the durability, be sure to let me know in the comments! 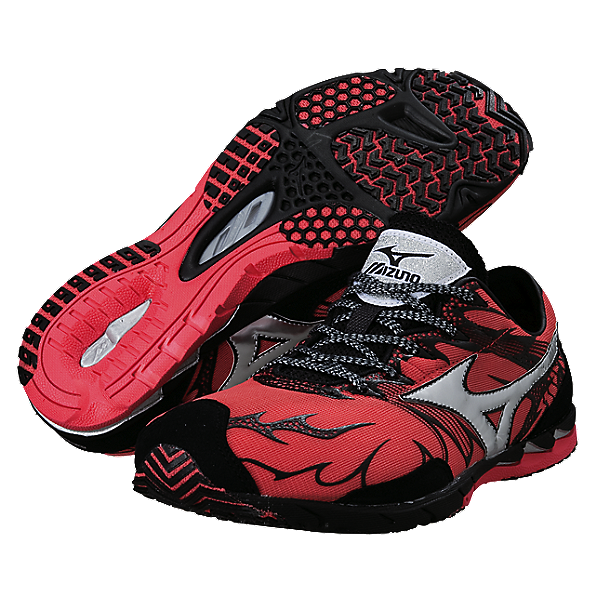 The Mizuno Wave Universe 4 retails for $125 and is available on Mizuno's website, as well as at many retailers that carry Mizuno products. I have found that they run slightly short, and I had to order a half size up from the rest of my Mizuno shoes (which seem to run true to size, or at least are the same size I wear in most Brooks trainers). So it's the same size as I wear in the Brooks T7 and Mach 13. Ironically, going with my regular size got rid of the weirdly wide toebox, but it was way too short for my foot. So try it on if you can. Full disclosure: I received the Universe free of charge as part of the Mezamashii Project. The opinions expressed in this review are mine and based on my experience, and do not reflect the opinions of Mizuno or anyone else. Thanks Kyle, sent you an email. To me, the ankle collar is too irritating to wear without socks, even if the interior itself isn't so bad. Still, while I prefer to run sockless in general, I think the Universe does better with them. I didn't notice the ankle collar, luckily for me, because I hate flats with socks. I should put a disclaimer with this though...I tore up the back of my ankles back in 2007 with the Brooks T5 Racer and it healed as this dead skin callous, so it's rare that an ankle collar will rip up the skin over my Achilles anymore. I don't even know how that happened because certain parts on my feet that are calloused just blister under the callous, but I'm not complaining. If you hate socks, you could always try a small piece of medical tape or duct tape on your skin where the heel collar bothers you, assuming you like the Universe enough to still want to wear it. I basically only wear the shoe for track work these days, and given the shorter duration of running, that fixes the problem as well. Just to add to temptation: NB 5000.